Pete Davidson net worth and salary: Pete Davidson is an American comedian who has a net worth of $4 million. Pete Davidson is best known for being a featured comedian on Saturday Night Live and was the youngest cast member in the 40th season. In addition to his work on Saturday Night Live (which began in 2014), he has also appeared on several MTV shows including Guy Code and Failosophy. Davidson was born in 1993 and raised in Staten Island, New York. His father was a firefighter with the Fire Department of New York and died during the September 11 attacks in 2001. Before SNL, he appeared on the shows Nick Cannon Presents: Wild 'N Out in 2005, Jimmy Kimmel Live! in 2003 and in the film School Dance in 2014. In 2015, during a roast involving Justin Bieber on Comedy Central, Davidson made waves for delivering a burn on Bieber involving the late Fast and the Furious star, Paul Walker – Comedy Central cut the joke from the show before it aired on the network. Pete Davidson dated Larry David's daughter Cazzie for several years. After they broke up, Davidson became romantically linked to superstar Ariana Grande. Pete and Ariana became engaged in June 2018 after dating for less than a month. Within a few months, Pete was romantically linked to actress Kate Beckinsale. 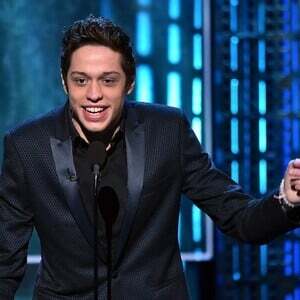 Pete Davidson Saturday Night Live Salary: As a main cast member who has been with the show since 2014, Davidson earns $15,000 per episode he appears on. Assuming he makes at least one appearance on all 21 episodes per year, Pete would make around $315,000 per year from SNL. 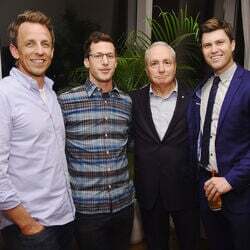 The highest-paid cast members make $25,000 per episode, roughly $500,000 per year.